Sandy's wrestling team simply didn't give up on its way to a 37-36 dual win at Centennial last Thursday night that gives the Pioneers the inside track to the league's regular-season title in their return to the Mount Hood Conference. "We didn't want this season to be about wins and losses, but winning sure is fun," Sandy coach Larry Topliff said. "These first two wins are huge for us, going up against the top teams in the league." Sandy knocked off reigning MHC champ David Douglas in its league opener the previous week. Thursday's match looked to be a runaway for Centennial, which scored a forfeit and three pins to start the night. That lead would grow to 30-3 nearing the halfway point of the dual after Ohio State-bound Phillip Kue transitioned from a reversal to a pin with about a minute left at 138 pounds. He celebrated with a leap into the air and a shout. "We've had a rivalry with Sandy over the years and now it's back," Kue said. "This is basically the Mount Hood finals tonight, and we want to get that done for our coach (Roger Matthews)." "For us to win tonight, we needed everyone wrestling at their best, and they found a way to come up with it," Topliff said. Weber got an escape to regain the lead, while Sparks hunted for the winning takedown. He took several shots, but Weber countered to stay on his feet. "I finally did what I should have been doing the whole time and got into a sprawl — I guess you learn from your mistakes," Weber said. The two met in the center circle for a restart with 0:07 on the clock. Sparks got in on his opponent's legs and slipped behind Weber with the clock showing all zeroes. The two referees gathered for a moment before the head official stepped between the two wrestlers in the center circle. "I didn't know if they were going to give him that two — it was nerve-racking — it was a make-or-break point," Weber said. In the end, the referee wrapped his hand around Weber's wrist and raised his arm for the 11-10 decision. Still, Sandy was down two points in the team score. More wins were required. Kael Schilperoort, wrestling up two spots from his idea 170 spot, came out on top in a somersault with his opponent at the edge of the circle to build a 6-2 lead early in the third round at 195 pounds. Centennial's Gabe Steen would give himself a chance with a reversal with a minute to go, but he was unable to turn his opponent for the go-ahead back points. Schilperoort earned the clinching escape with 0:07 left to give Sandy its first team lead of the night. 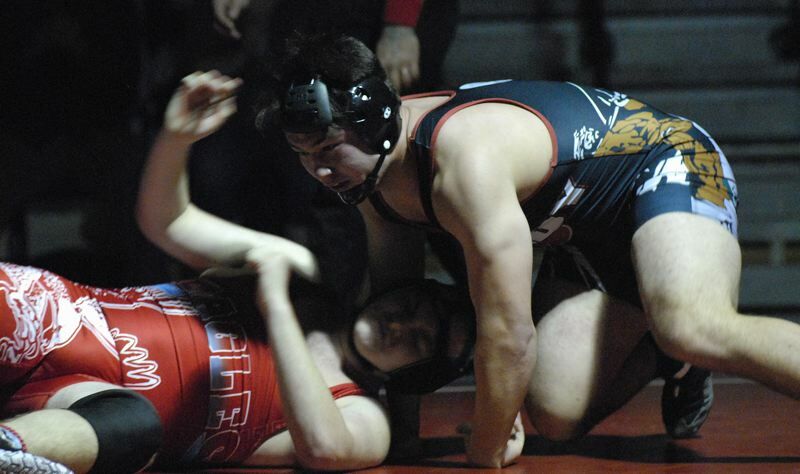 "We were missing a varsity wrestler tonight and that forced us to wrestle up in a lot of spots," Topliff said. "We had to do some guessing, but we tried to make the lineup as strong as possible." Before the 220-pound bout started, Centennial teammates and coaches were imploring Tyson Sadler to just avoid getting pinned. That proved to be a tall task against Sandy's Jake Rademacher, who piled up 39 wins last year — half of them coming by fall. This night proved no different, as he needed less than a minute to flatten his foe and clinch the dual win for the Pioneers. Sandy hosts Gresham on Thursday, Dec. 20. The Pioneers got onto the scoreboard when Colby Giltner scored a 13-8 decision at 132 pounds. He was up two points midway through the bout before pulling off a reversal and back points to build his largest margin at 10-4. Centennial's Tui Laithang got back within two points as the clock ticked under a minute in the match, but Giltner finished it off with an escape, followed by a step-over takedown with 0:09 left. "My double leg was working early, so that gave me confidence that I could keep scoring points through the entire match," Giltner said. "I knew the score was close, and I just gave it everything I had left. It feels good to be that first scorer for my team tonight."